The moving of any residence can be a major change in your life whether it be an apartment or large household move. 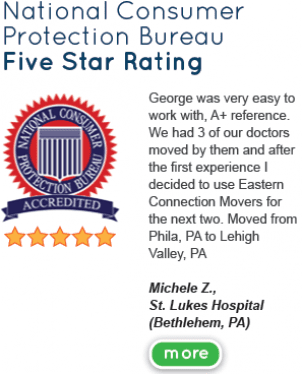 For over 30 years Eastern Connection Movers has helped customers just like you. No job is too small or too big. Let us create a personalized moving plan for your residential move. Local (484) 461-8685 or out of state (877) 480-6683 or fill out our online request form. They were fast and professional. Nothing missing, no price shock, no broken items, everything went as advertised which has never happens to me before. I will absolutely use them for my next move. Had an excellent experience with Eastern Connection Movers, for a local move. Quick, efficient, careful, and professional. Highly recommended!